A college science professor is able to combine a love of teaching with a love of science in a lucrative and rewarding career. As number three in the top 50 jobs in America according to CNNMoney, the job of a college professor is highly valued. The job of a science professor is even more valuable, because these leaders are at the forefront of many of the chances and research studies in the realm of science. College science professors carry not only the financial benefit of teaching at the college level, but also the intrinsic benefit that comes from inspiring the next generation of scientists. Add to this the research opportunities this career provides and you have an extremely rewarding career option. Teaching at the college level also gives you some flexibility with your schedule. While professors will need to be in your classroom for teaching hours and in the lab for research hours, and your school will require you to maintain office hours as well, you will have a measure of choice in when these will be scheduled. Other responsibilities, like conducting research and grading student work, can be completed whenever it fits into your schedule. The Bureau of Labor Statistics does not publish salary information for specific subject fields, but it does indicate that college professors in all subjects make an average of $62,050, with the top 10 percent of wage earners earning $130,510. This is significantly higher than the average for all educational jobs and the average for all occupations. 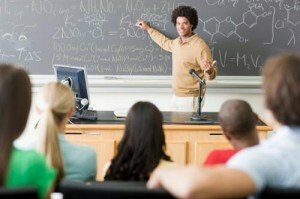 The first step in becoming a college science professor is choosing a specialty. Few, if any, science teachers on the college level teach multiple disciplines. Interested students will need to decide what branch of science they wish to pursue, and then tailor their coursework to that particular branch. Science can include chemistry, physical science, biology, life sciences, agricultural science, botany and many others. You will need to weigh your interests against the demand for a particular position when determining what your specialty will be. The road to becoming a college science professor is a long one, but if you know this is the career you want to pursue, you can make it a little shorter by pursuing the right courses from the very beginning of your education. The Bureau of Labor Statistics indicates that all postsecondary teachers, including science professors, begin with a bachelor’s degree, typically in their subject field or in science education. These programs take around four years to complete and can be completed online or through a traditional course of study. A master’s degree is the entry-level degree requirement for any college teaching job, but most four-year colleges and universities require doctoral studies, which may be a completed doctoral degree or candidacy in a doctoral program. After completing your undergraduate degree, you will complete your graduate studies in the branch of science you wish to teach. The BLS indicates these programs take approximately six years of full-time coursework after the undergraduate degree is complete. Being a science professor requires time spent in scientific research, and this begins during your graduate studies, culminating in your doctoral dissertation, which will show your research and any findings it generated. Those research skills will serve you well in your future career as you spend time researching as you teach young scientists. Each school that hires college science professors will have its own work experience requirements, but some experience teaching on the college level is helpful. You can get this experience during your graduate studies by working as a graduate assistant, teaching some undergraduate coursework while earning your degree, or you can gain it working at a two-year college after attaining your master’s degree and while working for your doctoral degree. Either way, this teaching experience will help position you to land available teaching positions at four-year colleges when they come available. With the right training and work experience, you can land a job as a college professor, enjoying all of the benefits of this research-intensive, yet financially rewarding, career field. For more information on starting this journey, fill in our online form today.